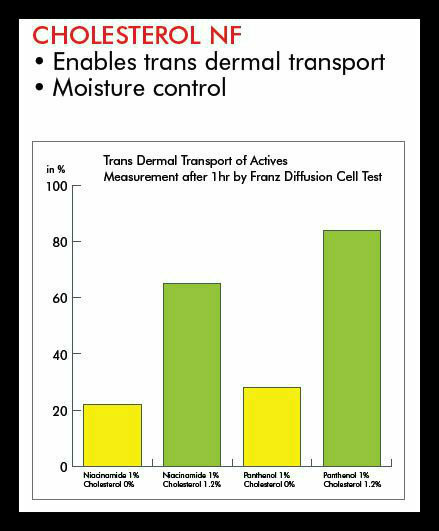 Dishman recently conducted a study to identify how Cholesterol NF steers the molecular transdermal transport of water soluble ingredients. In the study, Niacinamide and Panthenol were each formulated with and without cholesterol. The study showed that Cholesterol aided the transport of the active through the skin, resulting in an increase of the active in the skin. **The formulas were tested using the Franz Diffusion Device. The membrane used was Episkin from SkinEthic Laboratories. Analytical determination of the actives was calculated using HPLC. For complete study details or any questions please feel free to CONTACT US. to distribute all their Vitamin D3 products in North America; providing them with growth opportunities for the animal feed market. (vitamin D3 in oil) and Ergocalciferol. The new products from Dishman Netherlands will include Dishman D3 500,000IU for use in the animal feed market worldwide, Dishman D3 100,000IU for the food market, and also other Vitamin D3 products in oil. The new Dishman D3-500 grade will provide a high quality D3-500 to meet the growing demand in the marketplace. The history of Vitamin D production at Dishman Netherlands can be traced back to the 1920s and the invention of the process to produce vitamin D2 and thereafter in 1946 when the production of Vitamin D3 began. Each year Frost and Sullivan presents a company with the annual Product Line Strategy of the Year Award. In 2009 this was awarded to Charles Bowman & Company for their exemplary performance in the nutrition industry. Charles Bowman has strived to achieve the leadership position in the nutritional ingredients market with its strong product portfolio. The company has a strategically balanced product line that effectively meets the needs of the nutritional ingredients industries. Because the company has a clear focus on the nutrition ingredients segment, it is not difficult for the company to effectively penetrate these markets with its strength of products and dynamic distribution system, explains Sridhar Gajendran, a Frost & Sullivan Industry Analyst. Also, Charles Bowman has been in the market place for a long time and has built a very strong reputation in the industry. Thus, Charles Bowman & Company is the laudable recipient of the 2008 Frost & Sullivan Award for Product Line Strategy of the Year in the North American nutritional ingredients market. Founded in 1946, Charles Bowman & Company has grown to be the leading supplier of nutritional ingredients to the food, feed, pharmaceutical, and health industries. With their strong manufacturer relationships and partnerships, Charles Bowman & Company has become known for the quality ingredients and excellent service they provide to their customers.